You can print a formatted version of this FAQ (2 pages front and back, divided into the same sections as shown below) by downloading the PDF here. If you’re looking for a specific card, please refer to this excellent resource created by Shane Fletcher. All cards (when opening shrinkwrap): It may seem that cards 163-199 and 399 are missing, but those cards don’t exist, as there are gaps in the cards for production reasons. This is noted on the first page of the Chronicle. Rule vs Story cards: There are specific places in the Chronicle for rule cards and story cards. Do not place Story 1 on the Rule 1 slot in the Chronicle. The labels are clear on the cards and the Chronicle–just be aware of this at the moment that you’re actually placing the stickers in the Chronicle. Chronicle rulebook, page 4, rule 17: Cross out the words “face down or” from the last line (whenever a player gains an advancement card, it’s a face-up card, not a blind-draw from the deck). This is a typo. Unlocking a Crate: If you unlock a crate on a constructed building card, no matter how you obtained that card or the content on that card, it is YOUR crate. So if the header at the top of the Index Guide tells you to gain cards from it, YOU gain those cards. All numbers on the Index Guide are card numbers, not rule numbers. This is a common question answered on Rule 19 and the Index Guide. Missing Cards: If you ever come across a missing card, first check to make sure it isn’t stuck to an adjacent card. If not, request an image of the card on the Charterstone Facebook group–someone should provide it within minutes so you can keep playing. After the game, request the missing card on our replacement parts form and we’ll send it to you ASAP. Ties are friendly: Ties are consistently “friendly” in Charterstone, meaning that multiple players can win the game, have the most reputation (or the second most, or third most), achieve a guidepost, etc. This is noted in the rules through the use of language like “winner(s)” and “player(s)”. End of Game: At the end of Game 1, you will keep all coins, resources, advancement cards, etc (you will carry them into Game 2). If you’d like an extra guide to help you move forward at the end of Game 1 (there’s a lot of important stuff to do), please click here. Credit to Josh Ward. Automa (multiplayer): In multi-player games, don’t use Automa for Game 1. Read the next spoiler section after Game 1. Automa (solo): Adjust the strength of the Automa to 1 during Game 1 of Charterstone. There is a great Automa tutorial here. Read the next spoiler section after Game 1. Adding players: You may add players at any time during the campaign. At minimum, to allow them to be competitive, give them an equitable amount of capacity and glory on their charter chests based on what you think is fair for the current state of the game. We also recommend that you consider fair and fun play in giving that player some cards, coins, resources, etc (again, based on the current state of the game). Bumping workers: You can bump any regular worker on the board, even your own. Advancement cards: It’s not explicitly mentioned in the rules, but many types of advancement cards (including the assistant cards, which you’ll have before Game 1 begins), have icons in the upper right of the card that serve as a visual reminder of the card’s benefits (which are always described in more detail in text on the card). The reason for this is to make it easy to see what a card does from across the table even if you can’t see the text from there. This is purely informational. Advancement mat: Whenever there are empty spaces on the advancement mat, if there are cards in the deck, fill the empty spaces (there should never be empty spaces if there are cards in the deck). This isn’t clear in the rules. Assistants: Some assistants have bonuses that trigger when you use a building in a specific way. If you gain an assistant by using a building, the assistant’s bonus doesn’t trigger (if a player doesn’t have a bonus-triggering card when they actually use the building, the bonus does not trigger). Buildings with specific types of cards as the benefit: If you place a worker on a building with a specific type of card as the benefit, after you pay the cost, you may choose a card of that type from the face-up selection on the advancement mat. If there is no such card available, you don’t gain anything. This is noted under Rule 7 in the Chronicle (Advancement Mat & Cards) under “1. Gaining Cards”. Discarding vs. Archiving: Whenever you “discard” or “pay” a card, it goes into the general supply (i.e., a discard pile near the advancement mat). The only time you ever place something in the Archive is if the game specifically tells you to. An example of this is when you use a constructed building card to unlock a crate. As noted on rule 19, when you’ve finished opening the crate, place the card in the Archive. Glory Bonus for Capacity: Completing this row of glory allows you to gain 1 capacity at the beginning of every game from then on (not a once-off Capacity increase). This is consistent with the other glory bonuses–you get them at the beginning of each game after all other aspects of setup are complete. Spending influence tokens: There are some buildings (like the Cloud Port and Grandstand) where the influence tokens you spend end up on something related to the action instead of going to the general supply. For example, the 1 influence token cost on the Grandstand is the same influence token you should place on the objective card you choose to score. This is noted under Rule 6 in the Chronicle (Influence). Persona cards: The first persona card with an ability that each player receives will say something like, “After using a building with a pumpkin cost, gain 1 VP” (the exact resource will vary). This ability only applies when the printed cost on the building includes at least 1 pumpkin icon, not buildings with the “any resource” icon. It is possible to have persona cards that don’t look like your original persona. Also, you may only mark personas as used if you actually use their ability during the game. This wording on Rule 5 (card 15) is a little ambiguous. Zeppelin, Charterstone, Grandstand, and Cloud Port (or any other building focused on constructing buildings, unlocking crates, and scoring objectives): Part of the requirements for using these types of buildings are (respectively) to have/use an unconstructed building card, to have/use a constructed building card, and to have currently achieved an unscored objective. You cannot, for example, use the Zeppelin during the campaign to pay any 4 resources and gain 5 VP–you must actually construct a building. This isn’t as clear as it could be in the rules. Buildings: There’s no connection between any buildings (other than basic resource buildings) and any specific charter, so if you have a building card–any card–you can construct it. The only eligible location to construct a building is in your charter. This is noted on Rule 18 (card 14: Constructing a Building). Zeppelin: The cost printed on the Zeppelin (for constructing a building) includes any 4 resources. These are actually the 4 specific resources printed at the upper left of the specific building card you’re constructing. This is noted on rule 18. Don’t be afraid to construct buildings: Without spoiling anything, you will have more opportunities to construct buildings in your charter than the original 6 slots provided. Don’t let that original limitation stop you from constructing buildings. This tip was informed by Rahdo’s review. Game End: Even though the rule gets covered up, the rule for when the game ends is always the same: When the progress token advances to the last space, finish the round (each player takes the same number of turns), then the game ends. Capacity:: Each filled-in circle (capacity as indicated on your Charter Chest) represents exactly 1 component. So, for example, if you have 1 capacity for advancement cards, you may keep 1 advancement card. If you fill in another capacity icon in the card row, you could keep 2 cards, but they must be different types. Similarly, the minions you keep must be different types. This is noted on Rule 29 (card 19: Capacity). Guideposts: It seems that some people have overlooked cards 19, 20, and 21, particularly the instruction on card 21 to place card 400 on the board for Game 2. Make sure you don’t miss this instruction! By the end of Game 1, you should have unlocked cards 1-21. For each guidepost card, the goal players are trying to accomplish is indicated at the top of the card. Inactive Charters – Will They Remain Mostly Empty? At the end of Game 2, you will unlock a new setup rule (card 126) that will have buildings automatically placed in inactive charters at the beginning of Game 3 and each subsequent game until those charters are full. Automa (multiplayer): If you had fun playing without Automa, continue to play without it–you don’t need it for multiplayer games. After Game 2, you’ll unlock a mechanism (not Automa) that constructs buildings in inactive charters. If you find yourself still wanting to unlock more stuff and have more active charters after that, feel free to try out 1 Automa in Game 3 to see if you like it. You can always stop using Automa after that or add in more Automas. This is mentioned on Story 5 but may be confusing. 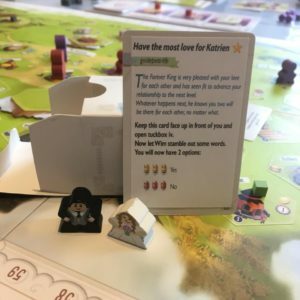 Automa (solo and multiplayer): Regardless of the outcome of Game 1, before the start of Game 2, set the Automa strength back to 2 and continue playing the campaign as outlined in the Automa rules. If you begin using the Automa after Game #1, please ignore this recommendation. If you discover this recommendation after you have already completed Game 1, you may remove 1 glory from each charter controlled by an Automa during Game 1. Automa (advancing progress token): The Automa does not advance the progress token when taking the Charterstone, Zeppelin, or Grandstand actions. It only advances the progress track when the Automa card shows the Advance Progress Token icon. Automa (unlocking crates): If the Automa gains cards by unlocking a crate that a player would normally keep, just place them in the discard pile. If the Automa unlocks cards that would normally be shuffled into a deck, shuffle them into the deck. Automa (lowest/highest numbered card on the advancement mat): When a rule refers to the highest or lowest numbered card on the advancement mat (e.g. when the Automa picks a building), it refers to the number on the bottom right of the card. Make Sure You Didn’t Miss This: By the end of Game 1, you should have accessed cards 1-20 in the Index and then read card 21, which refers to your first Guidepost card (card 400). When you make a choice on that Guidepost at the end of Game 2, you should unlock (among other things) cards 125, 126, and 127. Do a quick check to make sure you’ve accessed all of those components before moving forward. Triggering Abilities:: Many cards say something like, “If you use a building to gain X,” which means that if you gain any number of X while using a building, you trigger the ability once (no matter how many of X you gain). There are a few “whenever” abilities (like on the sherpa: “Whenever you advance the progress token, gain 1 VP”), which trigger every time you do/gain X.
Storehouse: The benefit for using the Storehouse building is listed as 2 VP, but it should be 4 VP. This is a typo on card 68 in the first printing. Minions:: Any player may gain and use any unlocked minion token. A minion is a type of worker that you may place only on unoccupied buildings in your charter. When you do, gain the minion benefit, then pay the building cost, then gain the building benefit. In this way, a minion may be used to gain something that you can use to play the cost of the building on which you placed it. The “minion’s building” is the building your minion token is on–if an opponent places a worker on that building, the minion stays there, and you gain the minion’s bonus. All cards that refer to “workers” apply to both regular workers and minions. The reference card for that minion type goes in the general supply for all players to see. This is noted on Rule 16 (card 33: Minions). Minions (Automa): During each game (except Game 10), the Automa gains one of each unlocked minion during setup and returns them to the general supply at the end of the game. The Automa retains nothing between games (except the persona cards). Constructing Over Buildings: At some point you will unlock an updated version of the building construction rules that state you can now construct on top of existing buildings in your charter (except your basic resource building). However, if a building has a wooden token on it–worker, minion, influence, or peril–you cannot construct a building there. Income Buildings: When you use an income building, the influence token you pay goes on the building. From then on, whenever the progress token moves onto or over the income icon, you gain the benefit on the income building. It’s tough to build on top of these buildings after peril has been unlocked (you can’t construct over a token), but there is a way to do it: Get the ongoing glory bonus for peril, and at the end of setup, use that bonus to remove the peril token from the income building. Variant: You can construct a building on top of an income building with a peril token, but you must discard the peril token. Friends: Friend cards give you a bonus when you use a building (i.e., place a worker on) in a specific charter to gain either coins or VP, even if that benefit comes from a source other than the building (e.g., a persona, assistant, etc). This isn’t clarified as well as it should in the rules. Items: On any of your turns–in addition to your standard action–you may complete any number of item cards in your personal supply by paying the 3 resources listed on the item. If you do, gain the benefit shown on the upper-right of the item card, then discard the card to the general supply. This isn’t clarified as well as it should in the rules. Peril: Peril tokens can be unlocked in a number of ways. The key to remember is that when you unlock peril, ALL peril tokens are part of the game from then on. You won’t use them in the current game, but they’ll be a part of setup in the next game. See rule 3 (card 36). Scrolls (type of Treasure): A scroll can be played (discarded) to avoid paying the cost of a building in your charter when using it. However, if that cost requires the placement of an influence token from your personal supply for the purpose of tracking information (like on an income building or scoring an objective), you must still pay that part of the cost even if you discard a scroll to avoid the rest of the cost. Archive is full: At a certain point, your Archive tuckbox will likely be full of cards. You can throw away the cards, but just in case you need to backtrack on a potential unlocking mistake, we recommend moving some of these cards to the open space in the Index, separating them from the unlocked cards by a small tuckbox (i, ii, or iii). Automa (Constructing and tokens): When constructing over a building, tokens on a building do not prevent the Automa from constructing there. If there is a token, lift the token, place the building, put the token back upon the new building. (After Game 3) Automa deck and reshuffling: Starting with game 4, you will set aside 3 cards after each shuffle (and bring them back before you shuffle again). You use the same deck for any number of Automas, drawing one card for each Automa’s turn. When the deck is empty, reshuffle ALL of the Automa cards (including any set aside previously). (After Game 4) “Tuckbox” V (Sky Islands): This isn’t actually a tuckbox–as noted on the note at the bottom of the Index Guide, this content is hidden in the bottom of the box under the insert. The sky island rules read that you can construct buildings on top of empty sky islands. However, this rule is trumped by the second version of rule 18, which says you can build on top of buildings in your charter. So if a sky island is in your charter, you can build on top of it even if there’s a building on it. This is ambiguous in the rules. (After Game 6) Spectral Worker: To identify the active player with the least cumulative glory, you will not use glory gained via victory points in the current game (you must identify the player before end-game step 3). The spectral worker acts exactly like a regular worker except that it also gives you an optional reputation when you place it or when an opponent bumps it. (Game 9):: If you cannot burn a candle at your gaming location, use random.org to pick a random number between 50 and 70, declare that number to everyone, input that number into the timer on someone’s phone, and then tell players that no one can look at their phone or clocks for the duration of the game. (Game 9) Automa: The Automa blows out the candle when it takes its second fuel shortage peril token. (Game 10): You cannot use the Coach persona in Game 10. (Before Game 10) Automa: Automas should not have any minions at the start of Game 10. All minions should still be in the supply and available for the special rules associated with Game 10 setup. (Game 12): The rule for this game is that “Only you may use your sky islands.” That is, your 2 sky islands on the board are private to you (you can use all other buildings just the same as other games). Guideposts: While guideposts aren’t used in post-campaign games, a viable variant is to shuffle the guidepost cards you used during the campaign and reveal 1 each game at random to create a shared goal and/or temporary rules. Player(s) who achieve the guidepost gain 10 VP. Credit to Richard Ham for this suggestion. Persona cards: At the end of the campaign, you’ll combine all persona cards with abilities into a deck to be used for future games. This includes all persona cards in personal supplies, Charter Chests, and the Archive, as well as cards 363-374 in the Index (you unlocked half of those cards during the campaign). This is partially explained on card 375. Recharge Pack: Place Charter Chest stickers on the chests. Place peril tokens in tuckbox i, the spectral worker in tuckbox ii, the candle in tuckbox iii, and all minions in tuckbox iv. No cards from the first campaign are reused, and there will be gaps between some of the cards (this is for production reasons). Board Sharing: If you want to share your finished board in photos (or exchanging them with other groups), feel free to join this group. French: The Index Guide (the loose piece of paper) should list box iv as one of the things to be unlocked by crate 32. Also, crate 36 should show cards 83 and 300 (not 84 and 300) in the “gain” column. The special rules for Game 12 should read, “vous SEUL pouvez utiliser vos îles volantes” (only you may use your sky islands; this means your sky islands are private to you, but you can still use regular buildings across the board). Also, the French version doesn’t have the correct wording for friendly ties for things like reputation, guideposts, winning games, etc (the correct way to play is with friendly ties, which means that more than one player can get 10 VP from the reputation track, achieve a guidepost, and win a game). German (Feuerland): click here; also, when you complete an Item card, you must discard the resources on the Item card. Hungarian: Both the rule stickers for Treasures and Items indicate that they are rule 18, but the Treasure rule is actually rule 14 and the Item rule is actually Rule 12. Spanish (Maldito): Due to a Photopshop error, hexes weren’t printed on the game board in the Spanish version. The exact location of the hexes is rarely important; rather, it is the number of hexes (6 per charter) that matters. During Game 1 setup, extract card 357 from the Index and use it as a guide for all future games to show where various hexes are located in each charter. No, and here is why. Here is the full postmortem on the Charterstone publishing process. Is Charterstone like any other games? It has building similarities (both in how they’re built and how they’re used as action spaces) to Lords of Waterdeep, Caylus, and Ora et Labora. What is unique about Charterstone (as compared to other legacy games)? The core mechanism itself is quite unique as compared to the other games: Each player constructs permanent buildings in their portion of the village that become worker-placement actions for any player to use. Beyond that, it plays 1-6 players (a first for legacy games), it has a branching story/decision tree that goes well beyond the more linear campaign story, it’s fully replayable after the 12-game campaign is finished, there’s an optional recharge pack that allows you to play a second campaign, and it includes 36 hefty metal coins in every copy of the game. Can I read the rulebook before I play Charterstone? Of course! It’s available here. What time period does the game take place in? Light-fantasy medieval (it’s not based on the real world). The game scales from 1-6 players. Charterstone is a game about 6 characters starting and growing a village. Whether those 6 characters are controlled by players or not doesn’t matter; the village needs to grow either way. So there’s a very easy mechanism–a little thing you do at the beginning of some games–to construct buildings (actions) in inactive charters. That’s it. No bot. However, for solo players or low player counts where players want for the inactive charters to feel more like they’re being controlled by a human, they can use Automa. Automa is also not a bot or a dummy player–it’s an intelligent system designed to provide the types of interactions you would have if its charter was run by a human player. But it’s totally optional. You can even use it to sub in for a player who can’t make it to one session. Charterstone’s style of worker placement isn’t about action scarcity; it’s about efficiency. It uses a similar mechanism to Euphoria in that on your turn you either place a worker (if you have one available) or you retrieve all of your workers. When you place a worker, you can place it on an action (a building) occupied by another worker, bumping that worker back to its corresponding player. Thus the number of actions and the size of the board is largely irrelevant; however, what is important to Charterstone in particular is that players get to see the vast variety of buildings in the game. That’s why there’s a very basic mechanism at the beginning of most games to allow the inactive charters to grow, just like the active charters. Charterstone is designed to be fun and functional for 1-6 players. Much more important than the player count are the players themselves. You’re likely to have a great Charterstone experience if you play with people who enjoy worker placement, who relish the uncertainty and surprise of discovery, and who can commit to playing the 12-game story arc. Do you have to keep the same group every time you play? Each game of Charterstone (campaign or post-campaign) is functional at any of the six player counts, and you can add and drop people throughout the campaign. However, the optimal experience is to play all 12 games of the campaign with the same people. Charterstone takes about 60 minutes to play, so it’s intended to be played a few times in a row for a total of 5-6 sessions. The box says ages 14+. Is this game only for a mature audience? The age on the box is actually just there for EU customs reasons (it avoids being classified as a “toy,” which requires rigorous testing). Charterstone is a family-weight game that can be played with kids 10 years old or younger, depending on their level of comfort with worker-placement games. Will there be a deluxe version of Charterstone? Every version of Charterstone is quite nice (36 metal coins, hundreds of uniquely illustrated cards, 230+ wooden bits), but if you want our special realistic resource tokens, you can get them from Top Shelf Gamer. How different will the end-of-campaign games be? Very different. There are 100+ buildings and only 36 spots for them on the board. There are also hundreds of permutations for the decisions made throughout the campaign. Does that mean some final versions of the end-of-campaign games will be worse or more imbalanced than others? They will be different (some vastly different), but one copy will be just as functional and fun as the next. There is no “correct” or “optimal” version, just different economies (e.g., in your game, pumpkins might be more useful than my game). As for balance, you can place your worker in any charter, so even if another player has buildings you want to use more than your own, you can place your workers on those buildings. And overall, there really isn’t such thing as an imbalanced board in Charterstone—in fact, a huge part of the game is about the development of unique economies. Like, in one game, pumpkins might be hard to get, while wood might be plentiful. Almost definitely not, as this is a very hard game to do that with. Who did the art for Charterstone? The cover art is from Mr. Cuddington. Gong Studios created all the buildings in the game (and the original announcement image). Is there a way the Index can make a triumphant noise every time I open it? Thanks to an awesome fan, yes! Click here. How many games are there in the campaign? There are 12 games in the Charterstone campaign, followed by infinite replayability (it is designed to be replayable). Can I use the recharge pack (separate purchase) to play two campaigns at the same time? I wouldn’t recommend it, as you might confuse rules that have been unlocked in one campaign and not another. It will also require some bookkeeping to remember which components each player keeps from game to game. Also, as you can see on the second image above, we strongly advise players not to even open the recharge pack until they’ve completed the first campaign, as the components in the recharge pack aren’t hidden in any way. Is Charterstone published in other languages? Yes, our first-run partnerships are for French, German, Italian, Portuguese, Russian, Spanish, and Chinese versions of Charterstone (in addition to English). Dutch and Hungarian are coming in the second print run. Has anyone proposed using Charterstone? Other questions? Please post them with a spoiler tag in the Charterstone Facebook group or as a new thread on BoardGameGeek and someone will answer within minutes!